How can performers earn enough money between acting jobs? It’s an age-old problem that many actors, including me, have had to battle with. It can be a nightmare: how do you find something that pays the rent but is flexible enough to allow you to go to auditions and to disappear for months on end to tread the boards? For me and many other actors, the answer lies in corporate role play. I have been a corporate role-play actor since graduating from RADA 10 years ago. I have worked in every sector of the economy from the military to the banking world to local councils. Having started off doing a few days a month, I am now in a fortunate position: when not working as an actor I always have work as a corporate role-player. More and more organisations are seeing the value in using actors for their assessment and training needs. The big buzzword in the corporate world is ‘experiential learning’. 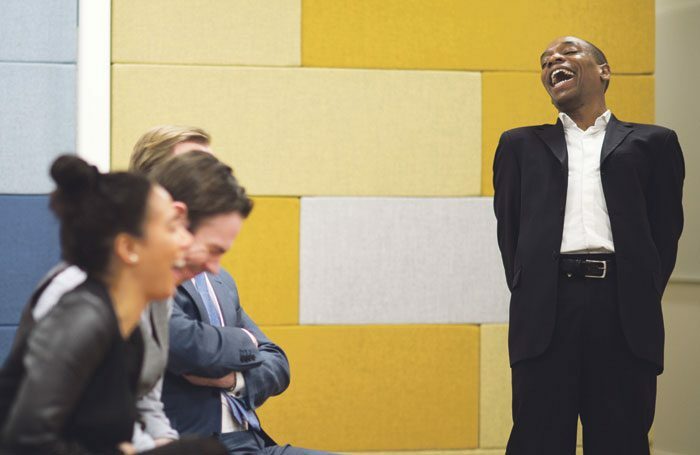 Rather than boring their employees to death with endless PowerPoint presentations, companies are allowing them to practise challenging conversations and situations with a real-life person. During training, some companies get employees to role-play with each other. I have never witnessed this, but I have heard that this often ends up in a car crash of self-consciousness. An actor brings many valuable skills to a role play including a lack of inhibition, the ability to create a character, true emotion, fearlessness and consistency. As well as the earning potential, there are many other benefits to be gained from working as a corporate role-play actor including constant script and character work, working on your improvisation skills and international travel. Most importantly, it’s fun. But remember, it’s not about you. It is not your opportunity to give your Hamlet or Juliet. You are a training tool; you are there to let the participant practise for their benefit. You will often be asked to give the participant developmental, evidenced-based feedback on how you felt during the conversation with them. It’s developmental because the feedback is to make them better, evidenced-based because it will have just happened. Feedback from a role-play actor will normally be centred on the participant’s use of eye contact, active listening, body language, open questions and their tone of voice. Having to give feedback is something actors who are new to this kind of work often find challenging. To be honest, when starting out, you probably won’t have to give feedback. But as the amount you work – and earn – increases, being able to give detailed, clear, honest and balanced feedback is a job requirement. Like everything, practice makes perfect: the more you do the easier it becomes. How much role-play jobs pay can vary widely, depending on the company you are working for, whether the client is in the public or private sector, how much preparation is required and how many times you do the role play during the course of a day. It can be anything between £100 and £300 per day. If, over time, you go on to become an actor-facilitator or a facilitator, this will increase. Role play comes in many different forms. One of the most commonly used is ‘forum theatre’, which normally consists of the actors showing the audience a bad version of a situation and then replaying it allowing the audience to guide you to a more positive outcome. This could be scripted or unscripted. You would normally be given rehearsal time for this type of work. For ‘briefed role play’, you are sent guidelines in advance to prepare. Role-play briefs can vary massively in length, from a single page up to as many as 20. It is your job to fully absorb the material, take away the key points and consistently portray that character for each role-play session. Consistency is so important here, as when role-playing you need to give each participant the same opportunity. A good approach is to start each session the same, maybe with an opening line and then flex depending on how the participant makes you feel. Bespoke role play – sometimes called ‘real play’ – is when the participant gets a chance to practise a real-life conversation that they need to have. They will give you a character description of the person they need to talk to. You will then practise the conversation with them following up with feedback on their impact on you as the character during the conversation. There are many role-play companies in the UK. The list seems to grow all the time, but, like acting, it is an oversubscribed industry. Role-play companies will audition at most twice a year, if at all. So if you have struck up a dialogue with a role-play company and they invite to you an audition, do everything in your power to get there – it may be six months or a year before you have that opportunity again. Most companies will have a ‘Want to work with us?’ page on their website detailing how they wish to be approached. When sending your cover letter, be sure to include a brief description of yourself, your training, most recent credits, why you want to work with the company and – most importantly – your real-world work experience. Actors always seem shocked at this last piece of advice, but having experience in the legal world may put you to the top of the list for a contract they have just secured with Clifford Chance. Equally, having undertaken many customer-facing roles may mean you get booked for a job with a company like the Arcadia Group. Start talking to actor friends, your drama school, your agent and friends working in the business world – frankly anyone who may be able to get you an ‘in’ with a role-play company. I’m not going to lie: initially, it can feel like an uphill struggle to secure role-play work, but if you persist you will see the fruits of your labour. We actors are some of the most resilient, hard-working and determined people on the planet. If you can fight your corner in the acting world, you can certainly survive in the corporate role-play galaxy. Good luck and hopefully see you on a job soon.